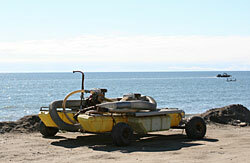 The Bering Sea is always by your side for the first 33 miles of the Nome-Council Road. During long winter months when daylight is fleeting and average temperatures hover around 7°F, the coastline is encased in ice and snow but, as days lengthen and the cold lifts, spring arrives in a hurry drawing life back into the landscape. Shortly after the ice leaves, typically between late May and mid-June, young salmon and Dolly Varden fingerlings, no bigger than a pinkie, exit the rivers for the sea. Herring are first to migrate up the coast from the Yukon River Delta followed closely by capelin (also called candlefish or cigarfish), which often come to the beach on the evening of a high tide to spawn in the sand. You can tell what species of fish are present by the birds that come to feed. Excited flocks of gulls and kittiwakes are drawn to schools of herring. Arctic terns—too small to grasp a robust 8-inch herring—will easily grip a thin, six-inch capelin, a smelt, or a two-inch salmon fingerling in their bill. Several species of loons, which nest in nearby ponds, often fly over the road on their way to feed in coastal waters. Meanwhile, horned puffins, murres, and pelagic cormorants nest at distant rocky headlands flying to and from nearshore and coastal feeding areas. In late fall, hundreds of beluga whales on their southward migration may be seen close to the shoreline chasing schools of tomcod (saffron cods). In winter, shore-fast sea ice typically extends a long ways offshore. The shallow waters beneath this ice shelf are shaded and particularly salty, luring deep-water species such as king crab closer to shore. Local residents cut holes in the ice and drop in crab pots or hand-lines to catch this Bering Sea treat. Marine algae grow in these seemingly inhospitable conditions and attach to the underside of the ice. During spring melt, the algae drop into the water causing a plankton bloom, which feeds herring and other fish on their northward migration. Beyond this zone, pack ice moves with the wind and currents, often opening a channel of water, called a lead, between the two types of ice. You may spot ringed, spotted, bearded, and occasionally ribbon seals either on the ice or in the water. In the summer of 1900, thousands of men, women, and children worked shoulder to shoulder to glean treasure from these shores after news of Nome’s “Golden Beaches” rocketed around the world. There’s still gold in these sands and, to this day, hearty independent miners work the beach with high bankers and sluice boxes or brave the cold waters in wetsuits to operate small modern, floating suction dredges, essentially vacuuming ore-bearing materials off the ocean floor. The city park at the east edge of Nome is a hidden gem of pond and tundra habitat. Birds flock here especially during the early days of spring-thaw when the pond is an ice-free oasis amidst broad areas of frozen ocean. With the constant arrival and stopover of migrant waterbirds, this revolving door is worth checking frequently during late May and early June, and species associated with beach areas and marine waters are just steps away. At least 40 bird species, including waterfowl, shorebirds, raptors, gulls, terns, swallows, and songbirds (warblers and sparrows), can be seen at this location over time. Red-throated loon, northern shoveler, northern pintail, greater scaup, green-winged teal are common waterfowl species nesting at this pond. 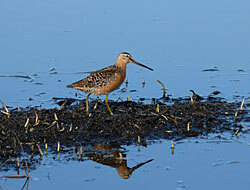 Red-necked phalarope, sandpipers, and other shorebirds frequent this area. Bristle-thighed curlew may be here in August staging for migration. Arctic tern arrive from beach nesting zones in search of food. Muskrat, red fox, mink, lemming, vole, and shrew are common in meadows. 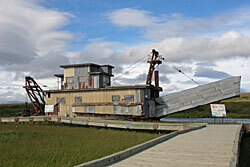 This 1940s-era gold dredge still floats in a dredge pond, but it saw little action in its day. By the time it arrived, shipped in pieces from Seattle in 1946, gold prices had fallen with the end of WWII. The dredge was repossessed by the bank in 1947 and hasn’t operated since. Interpretive signs tell its story and a boardwalk across the wetlands provides enhanced bird viewing. Common raven may nest on the dredge. Mew gull, terns, phalaropes, and long-tailed duck are usually found on the perimeter of the pond. The bridge marks a mixing zone where fresh river water meets tidal salt water and turns brackish. This creates a blend of water types and habitats and attracts many different birds to areas of open water or the mud-bar edges of islands. Birds forage, loaf, and roost, sometimes in tight clusters of mixed species, making this a good spot for lengthy observations. Wide meadows and broad, lazy, bends in the river also attract geese, cranes, shorebirds, and gulls in good numbers, even unusual species like arctic loon, great knot, black-tailed godwit, red-necked stint, ivory gull, and white wagtail. Western, semipalmated, and least sandpiper, red-necked phalarope, and red knot favor the mud bars and edges of the river. Pelagic cormorants dry their feathers with wide-spread wings. 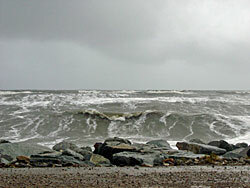 Glaucous, herring, and mew gull along with terns and black-legged kittiwake are often present in large flocks near the mouth of the river. Sabine’s and slaty-backed gull sometimes appear individually among large groups of gulls. Starry flounder and marine sculpin are food sources that attract birds to the mud flats. Pink salmon and silver salmon pass by on their way to spawn in the upper reaches of the Nome River. From the bridge you may see chum and pink salmon in July and coho salmon in mid-August. Dolly Varden and ling cod (also called burbot or lush) are also found in the Nome River. Beyond the bridge, a long line of small buildings hugs the coast where Fort Davis, a U.S. Army post, once stood during the early 1900s gold rush. Fort Davis was dismantled in 1918 as Nome’s economy declined. The buildings you see today are locally-owned subsistence camps for fishing and hunting. The Inupiat fished and hunted this area long before the soldiers arrived because of its diverse and abundant birds, fish and mammals. Please do not trespass or disturb people’s belongings.